There are three observations from Blackboard’s users conference that we feel are important to share before we pull together our thoughts for more comprehensive posts, and all three issues build off of Blackboard’s strong focus at the conference on Learn Ultra as the future of their LMS product line. Learn Ultra "In Production" or "Using Ultra"
The first issue is terminology around Learn Ultra. Blackboard1 is pushing the metric that there are 61 or 62 Learn Ultra customers “in production” or "using Ultra", yet we have found very few that use, or even plan to use, Learn Ultra as their primary, institution-wide LMS. What gives? What became quite clear at the conference is that when Blackboard says in production, what they mean is that the LMS administrator has enabled the Ultra global navigation, which uses the new Ultra user experience framework as the landing page / dashboard with activity feed that users see before entering a specific course. The company calls this Base Navigation, but at this point every course can be configured to be in the Original Experience or the Ultra Experience. Thus, enabling the possibility of running a course in Ultra counts as in production. Once a school has enabled Learn Ultra Base Navigation, they could choose to move exclusively to Ultra (e.g. the University of Phoenix, Northwest Florida State College, and a few others), or they could choose to keep all courses in Original (e.g. Northeastern State University), or they could choose to have some courses in Ultra and some in Original (used by the majority of schools investigating Ultra). 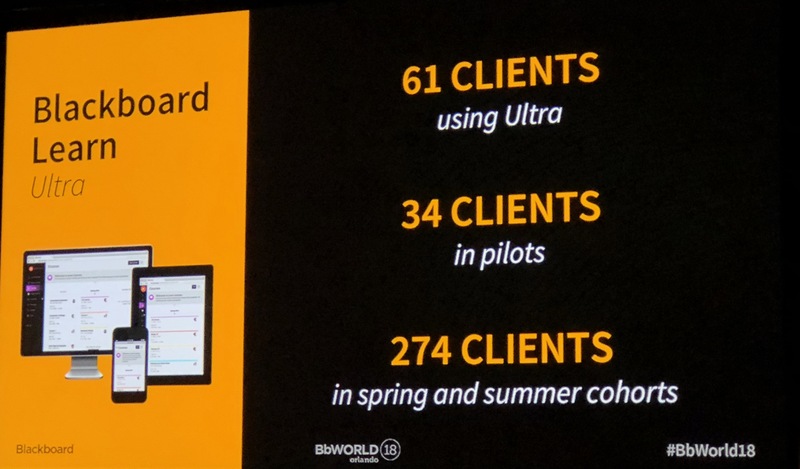 This last mode is known as Dual Course mode, and even Blackboard executives are surprised to find out that the vast majority of schools putting Ultra in production are in fact running in Dual Course. For many of these schools, there are no definitive plans to ever move exclusively to Ultra. This distinction is important, as the majority of functionality for an LMS occurs within a course, even if we did hear a few schools present that they saw some end-user benefits to having the landing page itself. We will add more commentary on this subject in future posts, but for now the takeaway is that Ultra in production numbers from Blackboard do not necessarily mean that any or most courses are in the Ultra Experience. The second issue is that Blackboard Learn has two experiences (Ultra and Original), three deployments (self-hosting, managed-hosting by Blackboard, and SaaS-hosting at using AWS), often resulting in three different dates for full delivery of new features. Learn Original on self-hosting and Learn Original on managed-hosting, which the bulk of their customers use, is the first case. 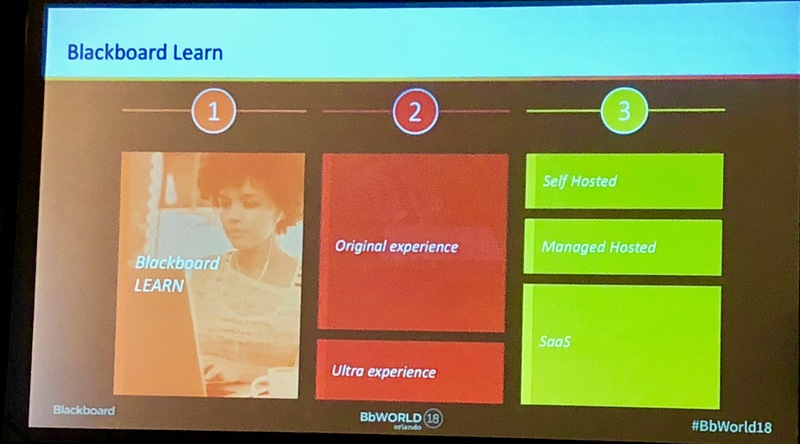 Learn Original on SaaS-hosting, which represents the bulk of their 383 customers on Learn SaaS announced at the conference, is the second case. Learn Ultra, which represents some subset of the 62 customers announced as "Ultra in production", is the third case. Of course there is significant overlap in terms of common code, such as the micro-services running in the SaaS environment for both experiences, or shared source code between deployment options. But from a feature delivery perspective, the full release often has three different delivery dates - Original SH & MH, Original SaaS, and Ultra. This is good news or bad news, depending on your perspective. For Blackboard's customers, it means more options without forced migrations. Blackboard staff stated several times in presentations and in hallway conversations that none of the deployment options or experiences have any plans to go end-of-life or even into maintenance mode. But on the other hand, Blackboard will not achieve many of the benefits of becoming a cloud product company until they can move the majority of development purely onto SaaS. The third issue, which is related to the first two, is that we believe2 that the migration to Learn SaaS might be a better indicator - at least in the short run - than Ultra adoption of whether a school plans to stick with Blackboard. Whether or not the school enables Ultra base navigation or any courses in the Ultra Experience. When a school moves to Learn SaaS, they tend to sign contract extensions for 1 - 3 years to cover the new services. And the migration to Learn SaaS does not suffer from the vague terminology issues - a school either uses Learn deployed on SaaS (through AWS) or they don’t. For now, just treat this as clarification on the complexities of Blackboard Learn LMS options that became more apparent at the conference. Update 7/23: Changed header and some text in second section to focus on dates of feature delivery.